What i thought: This book was absolutely fantastic, as was it's sequel. The writing is something else entirely, and Cassie's words flowed beautifully throughout the entire novel. The plot itself is amazing, and the characters are all well-developed and thoroughly creative. Also, the romantic backround in this novel was extremely supporting and i really think that it helped form the characters, and even made me fall in love with sarcastic, cynical Jace after just the first few chapters he was in. Clary is a wonderful heroine, one of those ones that you just love because of her many flaws and quirkyness, such as Zoey from the House of Night series. As much as she was shy and self-concious, Clary also was strongly oppinionated as well as head-strong and independent. Simon was your typical nerd who falls for his best friend, and Alec and Isabelle grow on you as well. I just loved Magnus Bane, too. This book really just has everything (Nephilim, vampires, faeries, werewolves, and even mermaids- all set in the urban landscape of New York) which makes it the perfect read for an extremely broad audience. This thrilling novel will have you looking down into every drain you passs on the streets, sure to find something--or someone--stairing straight up at you. Creative, romantic, and just completely and utterly thrilling, City of Bones will have you from page one. i recomend this book to fans of Stephenie Meyer and other urban fantasy lovers. 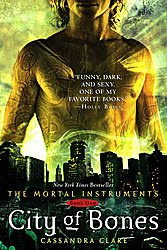 Also, if you enjoy this, please do not hesitate to read the amazing sequel, City of Ashes, and the third novel, City of Glass, which will be released this upcoming Tuesday, March 24th.